In an earlier post, we showed that global warming can cause more intense rainfall (and hurricanes, and typhoons) across the globe and, consequently, more landslides. Perhaps you would not expect it, but rainfall-induced landslides and soil erosion have the potential to release large amounts of CO2 in the atmosphere, which, in turn, can boost the climate change. Soils store from two to four times the amount of organic carbon currently in the atmosphere, most of which is contained in the first 1 meter below the surface, for example in the form of plant roots and organic nutrients. An important part of soil carbon is stored in tropical forests (see our post here), and another in peatlands, which are abundant at high latitudes but also in tropical regions, and are constituted almost entirely of organic matter, which accumulates faster than it decomposes thanks to special anoxic conditions in the subsoil. 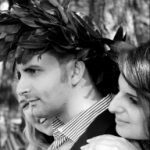 Soil plays an important role, together with the oceans, in counterbalancing the anthropogenic CO2 emissions. In fact, the terrestrial biosphere can absorb 20% of fossil-fuel CO2 emissions, a recent study on Nature Geoscience says. Deforestation and drainage to harvest wood and get land for agriculture or construction causes a direct loss of carbon stocks, but also makes the soil weaker and more susceptible to erosion and landsliding. The decomposition of organic matter in disturbed soils and landslide debris, both those lying along the slopes and those being transported through the water system, causes further emission of CO2 in the atmosphere. The complex effects of climate change, including temperature rising and more extreme weather conditions, are likely to enhance the emissions by causing an increase of landslides and soil erosion. And the effects, unfortunately, persist for long time, even if the slopes are artificially revegetated. Dr. Les Basher and colleagues from the Landcare Research institute in Nelson, New Zealand, showed that the revegetation of landslide sites is unable to restore the soil carbon stock completely, even decades after a landslide, resulting in a long-term net loss of carbon from the top soil layer, which is released, at least in part, in the atmosphere. A recent study, published on Geomorphology this year, was conducted in Taiwan by Dr. Jasmin Schomakers of the University of Natural Resources and Life Sciences, Vienna, Austria, and by Dr. Shih-Hao Jien and colleagues from the National Pingtung University of Science and Technology in Taiwan. In their study area typhoons are frequent and cause a large number of landslides, besides property destruction and loss of lives. 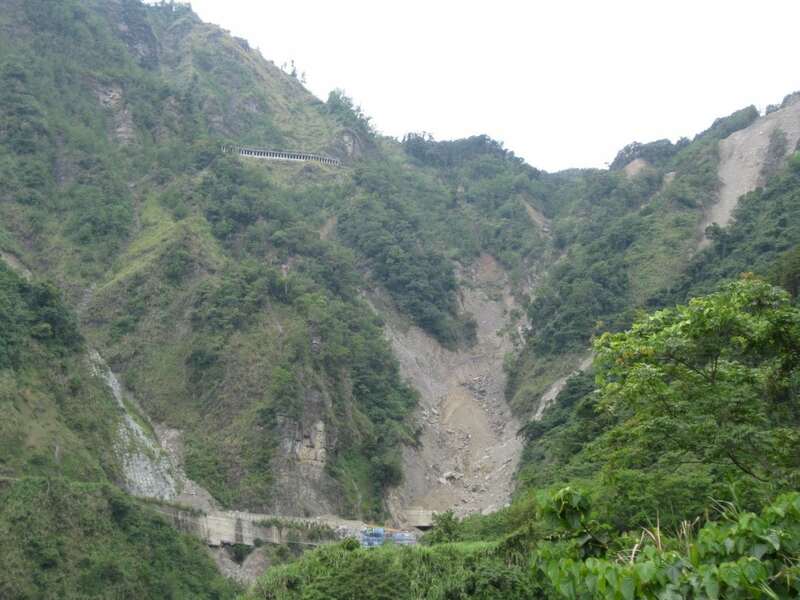 The researchers observed that after landslides completely removed the vegetation, the landslide scars were colonized by Miscanthus floridulus, a perennial tropical grass, which thrived for about 15-20 years. The soil carbon stocks took a while to increase significantly, and after 20 years they were still low. 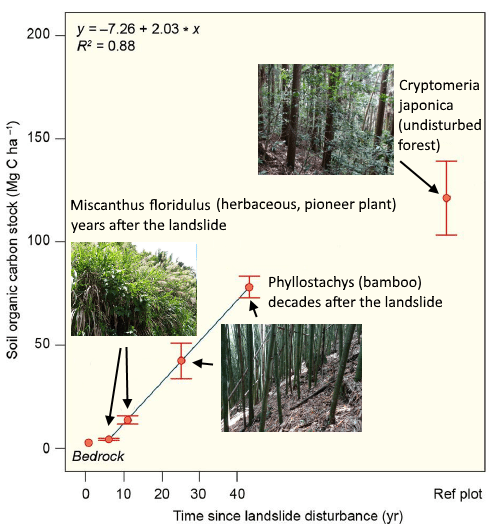 Later on, bamboo species invaded, and thanks to their fast growth, the organic carbon accumulation sped up. Soil Organic Carbon stocks (0 to 50 cm or 0 to bedrock) as a function of time since landslide disturbance, compared to a reference site. The dominant vegetation is shown (Schomakers et al., 2017). However, even after more than 40 years, the carbon stocks were still 40% below the levels found in adjacent forests (see the figure below). As global warming is expected to cause more severe weather conditions – Dr. Schomakers says – it is possible that landslides would occur so often that the soil would not have enough time to recover, and the re-accumulated soil carbon would quickly get lost again.